Ten Universal Principles is the college-level textbook upon which the Principles and Choices high school series is based. Perfect for academically exceptional students in advanced studies, college preparatory classes. Also a GREAT resource for teachers wanting to go deeper into the content in preparation for their classes. Purchase 5 or more copies and get them for $12.95 each! How do we make sense of life? How should we treat others? How should we reasonably be expected to be treated by others? When human life is at stake, are there reasonable principles we can rely on to guide our actions? How should our laws be framed to protect human life? What kind of society should be built? Many people rely on their religious beliefs to answer these questions. But not everyone accepts the same religious premises or recognizes the same spiritual authorities. Are there “public arguments” — reasons that can be given that do not presuppose agreement on religious grounds or common religious commitments–that can guide our thoughts and actions, as well as our laws and public policies? 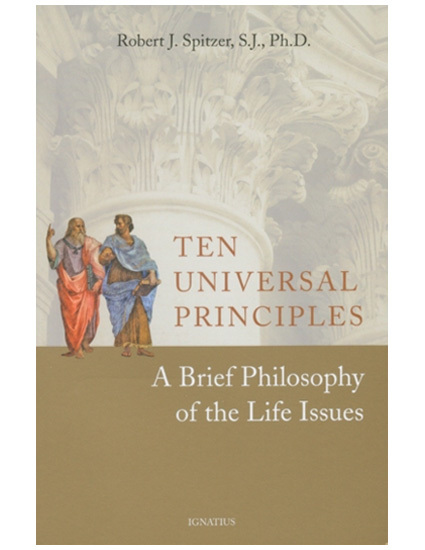 In Ten Universal Principles: A Brief Philosophy of the Life Issues, Father Robert Spitzer, S.J. sets out, in a brief, yet highly-readable and lucid style, ten basic principles that must govern the reasonable person’s thinking and acting about life issues. A highly-regarded philosopher, Father Spitzer provides an intelligent outline for thinking and talking about human life. This book is a powerful tool for persuasively articulating and effectively inculturating a prolife philosophy.